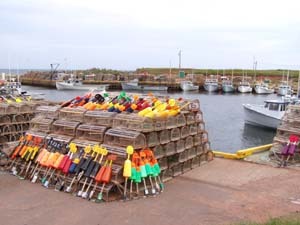 It’s in Prince Edward Island, Canada’s “smallest and greenest place” that stretches lazily 175 miles on Canada’s east coast — a place where it’s hard to get lost as every side road leads to the shore. I love PEI and have journeyed there every summer for the past 30 years. So I’ve grown quite intimate with much of what she has to offer, from incredible musicals and dramatic productions at the Confederation Centre of the Arts in Charlottetown to simple strolls along her magnificent beaches, and exquisite concerts celebrated during the Indian River Festival in the acoustically perfect St. Mary’s Church. Summerside has its own charm with a vibrant waterfront and gorgeous boardwalk, and Victoria by the Sea has to be one of the most beguiling villages in the world, with everything from a musty second hand bookstore in an old barn to a delectable chocolate factory, and a small theatre with an amazing summer repertoire. But for all the years that I’ve visited PEI and gone back to my old haunts, it wasn’t until this past summer that I ventured “up East” and “up West.” Now, I wonder why it took me 30 years to do that, for there is so much to celebrate in these wondrous regions. If I had three days to write about all that my husband Barrie MacGregor and I did, then you, dear reader, would need three days to read it. So I am going to focus my little treatise on artisans. For one thing, in 2007, Canada is celebrating “Craft Year 2007” a nation-wide celebration of professional Canadian craft; and PEI has more artisans per population than anywhere else in Canada. In fact, there are over 30 craft guilds and organizations that support artisans, and close to 100 thriving craft, art, and giftware businesses on the island. They represent artists who are working with fibres and textiles, folk art and island art, metalwork, wood, jewelry, pottery, and glass to name just a few. We started our journey at the Alpaca Bay Farm in Pownwal, where owner Heather Jones gave us a tour of her farm. I don’t know when the woman sleeps. At the time, she had 48 Alpacas with four on the way. They are the most endearing animals and communicate by making rather large “mewing” noises. 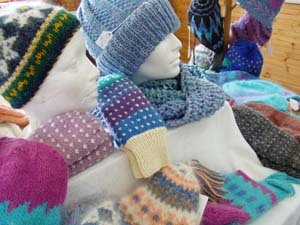 Part of her operation is a small gift shop loaded with Alpaca wear items including shawls, scarves and mitts. She also sells duvets and smaller items like headbands and jewelry. The fleece is prized and small wonder that it fetches a pretty price as each animal produces only about four pounds a year and it takes her a full month during shearing season to get the animals to part with their fur. Further along the South Eastern shore we arrived at Belfast Mini-Mills and were blown away by what’s going on there. First of all, they do custom batches of yarn from customers all over the word. Want your pet dog or cat hair made into yarn? No problem. Just send it along to these folks. There likely isn’t a fibre they have cleaned, carded, dyed and spun, including the hair from pot bellied pigs, yaks, qiviut, angora goats and camel. And not only to do they do custom fibre orders from all parts of the globe, they also build and export custom made Mini-Mills and have several of their machines set up around the world including Australia, Bolivia, England and New Zealand. Aside from enjoying talking with the personable staff, I got a chuckle out of the various kinds of animals that roam around the property including ducks, chickens, geese, pigs, llamas and a rather foolish cow that stood for hours on top of a large pile of manure. She was quite comical. Our next stop, the Rossignol Estate Winery at Little Sands, was a little less intense. In fact it was downright laid back as it was not a “production day” and the premises were rather quiet. Owner John Rossignol was happy to chat about his beloved wines. It all started rather happenstance for John, who moved to PEI from Ontario in the 1990s and while trying to decide what career to pursue, he started making wines. His interest and expertise grew and grew and voilà! He now manages 10 acres and a small production facility. It’s the island’s first and only commercial winery and there are many unique things about this establishment including the fact that all the labels are replicated from original Island artwork. In their 11th year of operations, the winery is known for growing organically, and it also uses 100 per cent pure oak barrels, (not oak chip or oak seasonings), which adds a special flavour to the premium reds, as well as a unique flavour to their Haneveldt Apple Cider. One of the most popular wines is a Strawberry Rhubarb apéritif. It’s also interesting to note that visitors can request taste samplers for a loonie (one Canadian dollar) and the proceeds are donated to the Queen Elizabeth Hospital in Charlottetown. 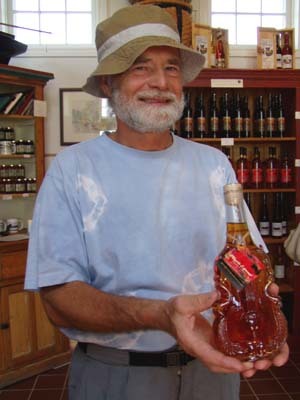 One of John's favourite inventions is a maple liqueur, sold in a bottle that’s the shape of a fiddle! Another spot that took our fancy is called Spit’n Image in Murray River. Sheila Woerdmann is the seamstress/knitter and she explained that all her garments are made from imported alpaca fibre. The fleece is luxurious, versatile, soft as silk, and has dramatic draping qualities that make incredible garments. The yarn she uses is superfine and is 100 per cent certified organic and is both dye- and chemical-free. 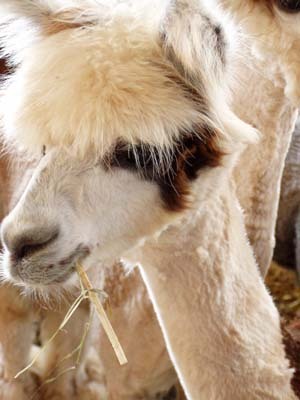 Something I didn’t know is that alpaca fleece has no lanolin so it’s a great choice for people who have allergies or who find it difficult to wear wool. Further up the coast, we found Teri Hall at her small home studio called Fire and Water in Bay Fortune. Teri makes stunning pieces of jewelry from PEI beach glass that she melds together with sterling silver. She scavenges for beach glass herself, and always thrills to the hunt. A former probation officer with the Department of Justice, she started making jewelry as a hobby but she soon realized how passionate she was about pursuing this as a career so she took up silversmithing. 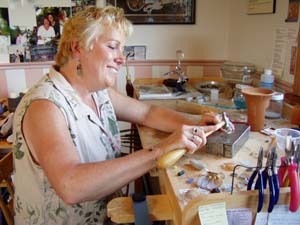 After apprenticing with Kim Goldsmith in Halifax NS, she set up her own shop. (And she continues to study with her mentor). Teri loves creating unique one-of-a-kind earrings and necklaces, and she is starting to get quite a reputation for her work. The charismatic entrepreneur is careful to point out that she uses the beach glass “as is.” That is, she doesn’t polish it or alter the bits of glass in any way. She also provides a service where a customer can bring in a piece of glass or pottery that they want turned into a custom piece of jewelry. It could be a shard from an old family heirloom or a sliver from a prized plate or teacup. Matters not, for Teri will find a way to make that piece sing — and last forever. One morning we were pleasantly surprised to find both Jacques and Diane Gaudreau at their premises in Rustico. Called Gaudreau Fine Woodworking Artisans, it’s home not only to their magnificent woodworking studio but from here they also showcase the work of over 20 Maritime potter’s work in the exquisite 2000-square-foot gallery. We were lucky and found Jacques on the premises. He gladly gave us a demonstration on the finer points of making a large bowl. He uses everything from black walnut to bird’s eye maple, red oak and cherry to turn out designer hardwood items that are really extraordinary. 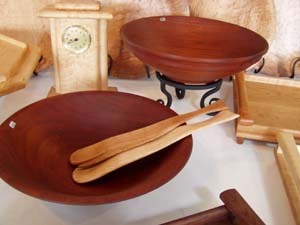 Boxes, bowls, and bookends are just a few of the many fine wooden gift items that he makes here. And there’s a bonus: several times a day, visitors can watch the staff making wooden items from behind the safety of a large picture window. It’s fascinating stuff and something that people enjoy. As a point of interest, the wood shavings are scooped up and sent to Leslie Kwiatkowski who operates PEI Smoke-Fired Pottery in Miscouche. Alas, we didn’t have time to visit Leslie, but we saw her work at Gaudreau’s and it is breathtaking. On our last day of travel, we headed west and made all kinds of discoveries but one in particular was over the moon weird — and wonderful. Called the Back Road Folk Art and located in Lauretta, (as the name implies, on a back road, ahem, in the middle of nowhere.) Anyway, it’s well worth trying to find this place for every single time I think of it my face breaks out in a big grin. 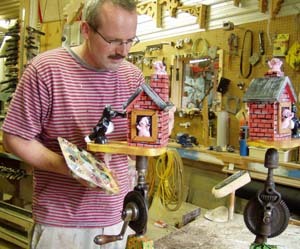 The gallery and studio features the folk art of Kerras Jeffery. He’s quite a character and has filled his studio, barn, and house with the zaniest carvings, dressed-up antiques, and some very unusual furniture. It quite defies description save to say it borders on the silly and the sublime. Kerras is well known for having the world’s largest working hand-held eggbeater installed in front of his house. He also recently added an addition to his property: the Olde Times Garden House Museum. It’s a hoot and features a guessing wall (husband Barrie said you know you are old when you can name most of the items on that wall!) The only part that annoys me is that there is a section in the museum dedicated to how skunks came to the island as tourists and never left — and I was so busy gawking at other displays that I somehow missed this one. A good reason to go back, eh? At least I won’t be waiting another 30 years to return and explore these amazing sections of Prince Edward Island. They are now on my “must do” list and it looks like we’ll simply have to add another week to pack them all in this year. 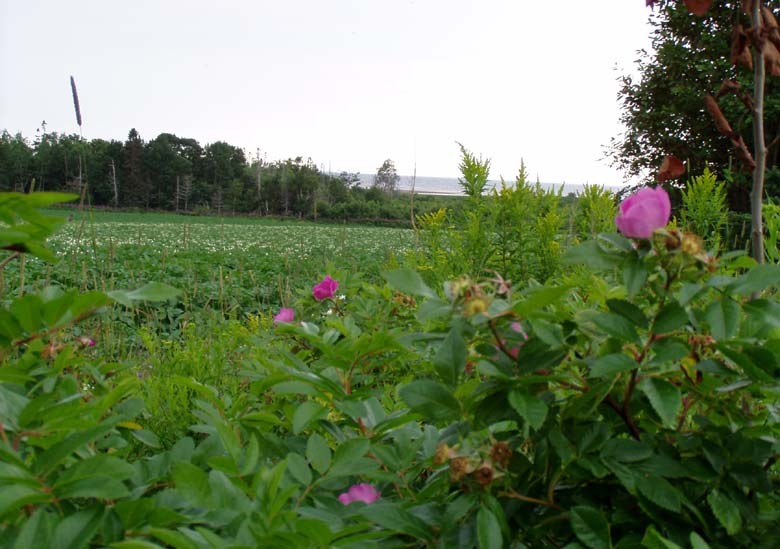 Pioneer Farm, located on Route #176 in Glenwood is 150 acres of wonder. Judy and Jim Bertling operate this panoramic woodland and seascape farm, which is powered up with solar and wind energy. They have a vacation cottage and encourage guests to take part in farm life. They’ve also introduced llama picnic trekking that is hugely popular. If you are looking for a central spot where anywhere on the island is within easy reach, one of the most central places is The New Glasgow Inn Carol Macmillan is the hostess and she knows how to take care of her guests! I’ll never forget her breakfasts. She’s as likely to pull out of the oven a freshly baked new potato medley with crunchy bacon bits as not, and her omelettes and muffins are drop dead gorgeous. Her home is adjacent to a golf course and that alone offers free entertainment! And if you really want to get away from it all, the place to head for is MacWilliams Cottages and B&B in Cape Traverse which is only minutes away from the Confederation Bridge. But the best thing about staying here is that you have an entire beach to yourself. Imagine that! I have fond memories of digging clams here, going for three or fours swims a day then walking for miles along the shore, with not another soul in sight. 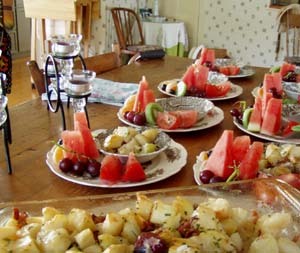 The MacWilliams also operate a B&B in their lovely farmhouse.